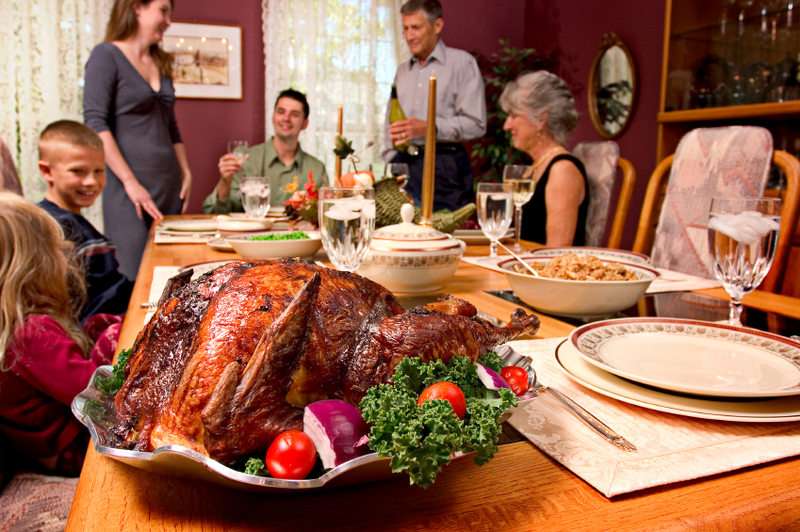 How to host Thanksgiving dinner without the stress! Thanksgiving doesn’t have to be stressful! Do you and your family love roast turkey? Then go ahead and make one. But, only if this year’s holiday allows the time and energy to undertake the project. This includes the time to select the best organic free range turkey you can find and get it safely defrosted in the refrigerator days in advance. It also requires the kitchen equipment to allow you to roast it and prepare the sides to go with it. Some people are lucky enough to have two ovens which makes the roasting and side prep much easier. Those with only one oven can prepare sides on the stove top or in a crock-pot or even on the grill. Don’t love turkey or don’t have the time – too busy working? Like we said, there are no Thanksgiving police. When thinking of your holiday menu, determine how much time you will have (if any) in advance for prep and how much time you are willing to spend in the kitchen on the big day. With that in mind, now start to plan a menu. Let’s say you have a few hours available the day before and are willing to actively cook for about 2 hours. Search your favorite recipes for dishes that will work in that framework. What about grilling some juicy grass fed beef steaks like Rib Eyes? What a treat! There are so many options – how about a grass fed beef roast or a juicy pork tenderloin! When you start with quality, grass fed and pasture raised meats the meal will be delicious any day of the year. Don’t go over board on the sides! Again, we’re working without rules here! Whether you’re roasting a turkey or grilling steaks or a pork tenderloin, think about the number of guests you expect and just make two or three sides in sufficient quantity. Ideally, make sides that can be made ahead or at least can be partially prepped the day before. Consider this: no one wants to overeat or become so full they are uncomfortable after the meal. However, some might overeat because they feel like they have to try a little of everything or insult the host(ess). What if you grilled those steaks and served them with some oven roasted sweet potatoes tossed in oil and seasoned with red chile powder, garlic powder, salt and pepper. Add a beautiful seasonal green salad with colorful veggies and a quick vinaigrette. That sounds like plenty of food to make most people happy on any day! Not enough variety for you? How about tossing some asparagus, sugar snap peas and cherry tomatoes in a hot sautee pan with oil, lemon juice and red chile flakes for heat! Dinner is served. These ideas are delicious, made from fresh quality ingredients and are sure to satisfy all your guests. Consider “outsourcing” part of your meal. Don’t like or have time to bake? Find a great local bakery and pre-order some pies, cookies for the little ones, whatever looks good! That alone will save you hours in the kitchen! You could also opt for bite size desserts to display artfully on a counter and everyone can help themselves and try a variety of treats! What about snacks and appetizers? Go for no cook ones. Like a beautifully arranged platter of cheeses, fruits like strawberries, grapes and apples and sliced baguette? Looks impressive but you can put it together in just 15 minutes, including slicing the bread. Or, ask the store you purchased the baguette to slice for you in their machine. Not hearty enough? Add some sliced nitrate/nitrite free deli meats, some fancy cornichon pickles and spicy mustard! Make a prep list like chefs do. Take a few minutes a week or so before the holiday and write down all the various items in your menu that require prep. Like washing the greens, chopping the vegetables (those that will stay fresh after cutting), marinating your steaks, or making the vinaigrette for the salad. And, make note of when these tasks should happen-the morning of, the day before, a week before? Then cross them off as you go and you are less likely to worry about details or forget something. After committing to your menu, go through your cabinets and pantry. Decide which pots and pans you’ll need to cook each item to make sure you have all you need-you shouldn’t need many if you’re going an alternate Thanksgiving meal route! Also do this for what you would like to serve or present each item in. Then use a sticky note to write the dish that goes in this bowl or on that platter. Select the serve ware (tongs, spoons, ladles, etc.) you’ll need to serve your meal. In this way, you’ll know in advance that each of your fabulous dishes will have a home on the buffet or dinner table. If you come up short, you’ll have time to run to a local store and pick something up that will suit. Another time saver is to wash your serve ware, bowls and platters well in advance of Thanksgiving and then wrap in plastic wrap to keep them clean until the big day – one less thing to do! What do all these ideas have in common? Simplicity! You don’t have to serve the same Thanksgiving turkey dinner every year. Some years maybe you can get extra time off work and the idea of that turkey excites you – go for it! What about the year when you can’t get time off work and you only have Thanksgiving day to prepare everything. Go for simplicity – this is your Thanksgiving, it can be whatever you want and have time for – remember the idea for grilling up some grass fed steaks? The people who gather to share the meal will be grateful for the food you prepare and the company of friends and family – now, isn’t that what Thanksgiving is all about? This entry was written by Jeff, posted on November 12, 2013 at 10:24 pm, filed under Blog, Education and tagged beef, grass fed, holiday, meal tips, steaks, Thanksgiving. Bookmark the permalink. Follow any comments here with the RSS feed for this post. Both comments and trackbacks are currently closed.